It seems whenever I visit Bermuda I almost always run into people I know. One big surprise I had while passing thru last month was bumping into Brad Sellew, who sold me Crazy Horse (ex-Wanderlust), the Pearson Alberg 35 yawl I sailed to West Africa aboard back in the mid-1990s. Here you see her anchored out in the Cape Verdes, where I stopped en route to the W’Indies in February 1997. Designed by the Swedish emigrant Carl Alberg, who also conceived such iconic fiberglass production boats as the Pearson Triton and almost all of Cape Dory’s product line (including the Cape Dory 36, 40, and 45, which are still built today by Robinhood Marine), the Alberg 35 is a prime example of a CCA-era cruiser-racer that is still a very viable low-budget coastal and bluewater cruising boat. Over 250 were built over a six-year period starting in 1961, and the majority are still in service. 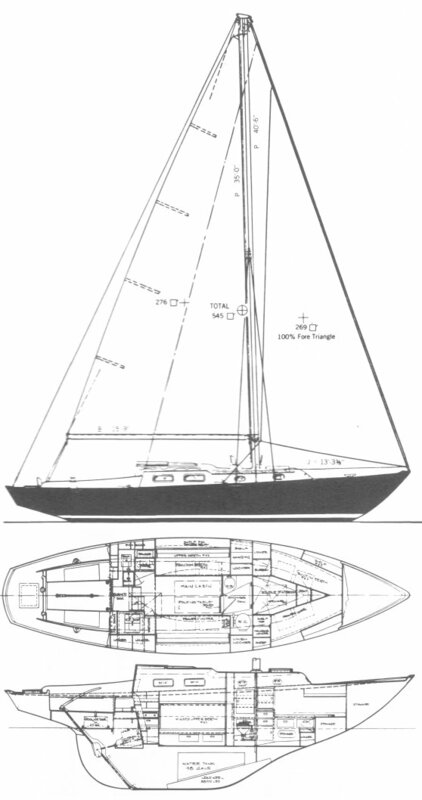 The original Alberg 35 could be ordered as either a sloop or yawl, with either tiller or wheel steering, and had two optional interior arrangements. The first features a traditional saloon with twin settee berths (plus two roll-away pipe berths over these) and a fold-down table with a small galley aft. The second is a dinette plan with two quarterberths aft and a larger galley in the saloon opposite the dinette. The forward cabin in both versions is rather commodius for vessels of this type and vintage, with a generous V-berth, a hanging locker, and a small bureau. There is standing headroom of 6 feet or better through most of the interior. 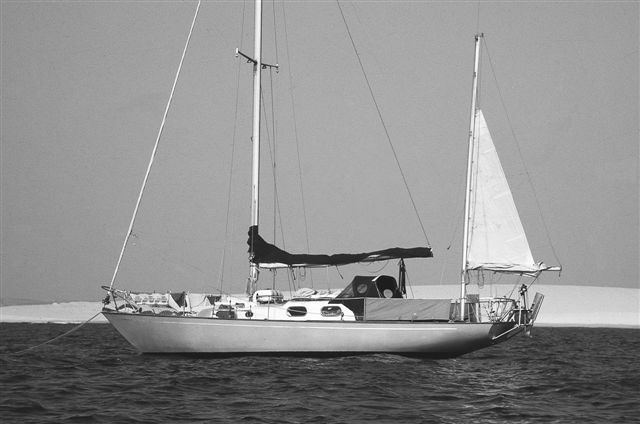 Performance under sail is typical for a classic CCA design. Thanks to its long overhangs and cutaway keel the Alberg 35 does sail a good bit faster than its abysmal D/L ratio suggests, but its narrow beam and slack bilges also makes it a tender boat, in spite of all the ballast it carries. In a moderate breeze to windward it quickly heels to an angle of about 30 degrees, with its lee rail just awash, and then sticks there. 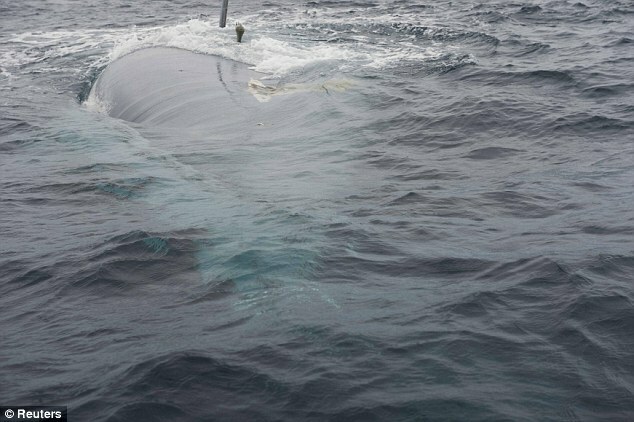 Having spent a couple years roaming the North Atlantic aboard Crazy Horse, I can attest they have a very seakindly motion and make excellent ocean boats, but they are a bit wet in strong conditions, thanks to their low freeboard. 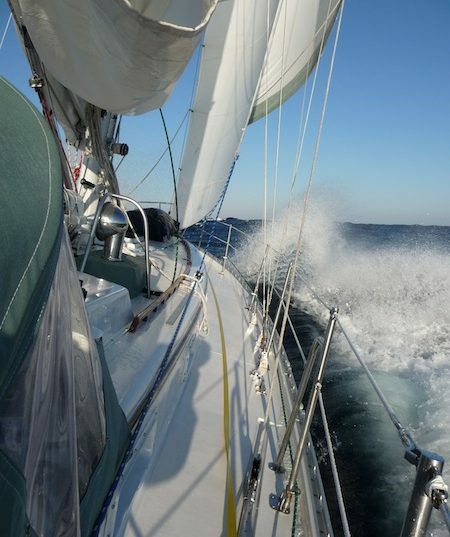 The mainsail is quite large relative to the foretriangle, and with its rudder so far forward an Alberg 35 can develop some strong weather helm, particularly when reaching. Some owners ameliorate this by putting on short bowsprits to enlarge the foretriangle; others choose to shorten the rather long boom and shrink the main a bit. 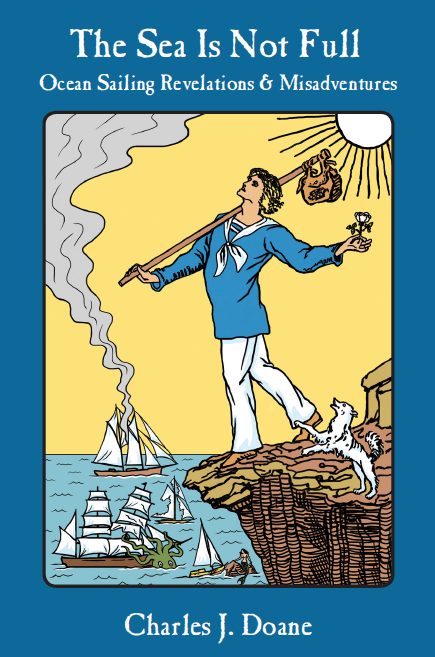 The downside to making the mainsail smaller, however, is that you may lose the ability to sail the boat under main alone, which often comes in handy. Note, too, the long overhangs and forward rudder position make it hard to back down under power. Construction is very simple and robust. The hull is solid fiberglass with more than an inch of laminate below the waterline. The lead ballast is fully encapsulated, so there are no keel bolts to worry over, though some boats have voids under the ballast that may need filling with epoxy. The deck is balsa-cored, and with boats this old there is a good chance some part of it will have become saturated over the years. Depending on how much of the core is wet, this is potentially the largest structural repair an owner of one of these boats will have to confront. In some cases, too, the core under the deck-stepped mast will have been crushed and will need replacing with a stiffer core material or solid laminate. The original exterior gelcoat on both the deck and topsides was laid on thick and is likely to have crazed over time. This was true with Crazy Horse, but the problem is solely cosmetic, unless the underlying laminate is exposed, in which case the boat’s exterior should be faired and refinished. On earlier models, the deck joint is also a bit suspect and is prone to leak if buried in the water for prolonged periods of time. The Alberg 35 is a great project boat, and most contemporary examples have been significantly modified by their owners. The original standard powerplant was the gasoline-driven Atomic 4, and most of these have been replaced with more modern diesel engines. (Those still equipped with original engines should sell for a significant discount.) The original rudder was mahogany, and many of these have been replaced with custom-fabricated fiberglass rudders. The original roller-reefing boom was spruce, and though a suprisingly large number have survived, most have been converted to slab reefing. Originally there was no traveler for the mainsheet, which was led aft to a pair of blocks either side of the cockpit behind the helmsman. On many boats travelers have been installed, either behind the cockpit, which is not so optimal as there is not enough beam back there for a traveler to work well, or just forward of the cockpit on the bridgedeck, which works much better. 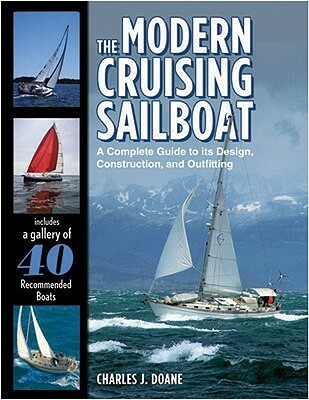 Other typical upgrades include installation of a bow roller (and perhaps a small manual windlass) for ground tackle, replacement of the undersized sheet winches, fabrication and installation of a seahood over the companionway slide, refinishing of the boat’s hideous faux wood-grain Formica interior, replacement of the original hot-and-cold pressure water system (the Alberg 35 was one of the first production to offer these as standard equipment), installation of refrigeration, plus rewiring and replacing the very minimal electrical panel, to name only a few. This seems like a lot of work, but the fact is there are few boats you can buy for so little money that are truly capable of extensive offshore work. I, for example, purchased Crazy Horse from Brad for about $28,000, put another $15,000 into repairs and upgrades, and had myself a very serviceable liveaboard bluewater cruiser. If you are willing to spend more upfront, it is not hard to find an Alberg 35 whose previous owners have already made extensive improvements. If you have little to spend and like to work on boats, you can by one dirt cheap and fix it up as you go along. By today’s standards the boat is somewhat slow and its living space is cramped and relatively primitive, but it is a solid, safe vessel offering lots of value for the money. I’ve raced my Alberg 35 for twenty years in the Caribbean. I lived on her for 13 years. Alberg sailed on my boat in the day, and added a bowsprit. I raked the mast back to compensate. With a big genoa, I’ve encountered no other cruising boat of her size can point with her. Between the sprit and the inside cord accomplished with a big genoa, She is NOT slow. I have many trophies from whipping much ‘faster’ boats, often boat for boat. You must heel he, of course, to get the waterline length, even in light air. Reef the main before changing the genoa, to keep the pointing angle. A sailor can make this boat dance. with the cutaway forefoot, she handles like a sunfish on the starting line. With her short rig, you have to be careful of where you start, or you will be drafted. I am looking into an Ericson Alberg 35, and am very interested in adding a bowsprit. I would be very grateful for any info, such as specs. Given the suggested weather helm, is raking the mast really necessary? The vision? When alone close to home, I would like to sail with a self-tending 100& foresail (maybe a furled 125%) on a bowsprit, be able to hoist a staysail on a removable inner stay (running backs?) in a blow, and have something in a sock when I need to brighten the scenery. Your thoughts pleeeease.